Draft: 2005, Pittsburgh Pirates, 1st rd. 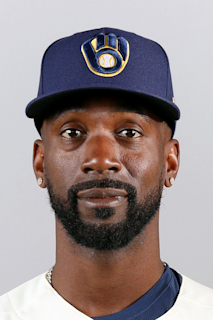 Andrew Stefan McCutchen… Married, wife's name is Maria; has one son, Steel Stefan (11/27/17)… Andrew and Maria were engaged on "The Ellen Show," 12/10/13… Was featured on the cover of MLB's The Show 2013… 2015 MLB Roberto Clemente Award winner… Hobby: Playing with his son…Signed by: Rob Sidwell. Finished T-8th in the majors in walks (95) with César Hernández... Collected 25 doubles and 20 home runs for the 8th straight season, the longest active streak among all players... Began the season with SF... Had a career-high 6 hits, 4/7 vs LAD (6-7, 2 R, 2B, HR, 4 RBI, SB) and slugged his 7th career walk-off home run (Wilmer Font)... Had a season-best 13-game hitting streak, 4/30-5/14 (18-48, .375 AVG)... In total, played 128 games in RF for SF (127 starts) and posted a .992 fielding % (2 E, 255 TC)...Traded to NYY on 8/31; at the time of the trade, ranked 8th in the NL in walks (73), behind Rhys Hoskins, who ranked 7th with 74 BB...Started 25 games for NYY, 15 in RF, 9 in LF and 1 at DH...Posted a .421 OBP with NYY, reaching base safely in 48 of his 114 plate appearances...Led MLB with 53 walks after the All-Star break; his 22 walks in September ranked T-4th in the majors...Played in 155 games between both clubs and combined to slash .255/.368/.424 with 20 HR and 14 SB...Reached base safely in his final 14 games of the season (9/14-29)... Played in his 1,500th career game, 9/28 at BOS. Completed his ninth season with Pittsburgh, batting .279 (159-for-570) with 30 doubles, 28 home runs and 88 RBI...Captured a Gold Medal while playing with Team USA in the World Baseball Classic in March...Was named the team MVP by the local chapter of the BBWAA for the sixth time in his career...Ranked eighth among N.L. leaders with a .336 average against left-handed pitching...His .313 average following May 14 was the eighth-highest in the National League...Was the Opening Day starter in right field; just his second professional appearance at that position and first since Aug. 22, 2006 while playing with Double-A Altoona...Reached base safely in 24-straight games between April 10-May 4...Hit his sixth career walkoff home run on May 29 vs. Arizona, tying him with Ralph Kiner and Willie Stargell for the most in Pirates' franchise history...Was named National League Player-of-theMonth in June after leading the N.L. in batting (.411), OPS (1.193) and OBP (.505) while also hitting six home runs and knocking in 23 runs...Doubled twice and recorded his 500th career extra-base hit on June 10 vs. Miami, becoming the eighth player in Pirates franchise history with at least 500 extra-base hits...Hit his 10th home run on June 13, making him just the fourth player in Pirates' history to hit 10 or more home runs in at least nine consecutive seasons (also Willie Stargell, Roberto Clemente and Al Oliver)...Recorded his third career three homer game on July 30 at San Diego...Hit his 200th career home run on Sept. 13 at Milwaukee. Connected off Baltimore's Kevin Gausman for first career grand slam on Sept. 26...Captured N.L. Player-of-the-Week honors for the final week of the season after going 8-for17 (.471) with three doubles, two homers and nine RBI in five games. Ranked ninth in the National League with his career-high 598 at bats...Hit .338 (22-for-65) with runners in scoring position following the All-Star break...Produced a .289 batting average, nine home runs, 35 RBI and an .869 OPS in his final 49 games, beginning with the action on 8/12 (was hitting .240 on 8/11)...Made his seventh straight Opening Day start in center field - the first Bucco center fielder to make seven straight Opening Day starts since Andy Van Slyke (1988-1994)...Homered in back-to-backs game on 4/16-17 vs. Milwaukee...Had his second career three-homer game on 4/26 at Colorado; joins Hall-of-Famers Ralph Kiner (four times), Willie Stargell (four times) and Roberto Clemente (twice) as the only players in team history to have multiple three-homer games...Made each of his first 61 starts from the second spot of the batting order before batting third for the first time on 6/15...Hit .237 (59-for-249) with nine homers and 25 RBI from the second spot and .268 (93-for-347) with 15 home runs and 54 RBI in 90 games from the third spot...Homered twice and had four RBI on 6/25 vs. Los Angeles...Was ejected for the first time in his career on 6/26 vs. Los Angeles; home plate umpire Chris Conroy ejected him after a called third "strike" in the seventh inning...Recorded his 600th career RBI on 7/27 vs. Seattle; also hit his 166th career home run on 7/27 tying him with Dave Parker for fifth place on the Pirates all-time home run list...Swiped his 158th career base on 8/5 vs. Cincinnati, tying him with Pie Traynor for 10th place on the Pirates all-time list...Homered and had all three RBI in a 3-2, 10-inning win at Milwaukee on 8/25...Produced his third multi-homer game on 9/15 at Philadelphia (two)... Had a season-high 13-game hitting streak from 9/13-25 (21-for-55, .382). Was named to his fifth consecutive All-Star team and was the starting center fielder for the second straight year; became the first Pittsburgh player since Roberto Clemente (8 years between 1960-67) to be selected at least five straight years and the first Bucco to start backto-back Midsummer Classics since Andy Van Slyke (1992-93)...Went 1-for-3 as the leadoff batter in the All-Star Game and homered off Tampa Bay's Chris Archer in his third at bat...Was the first Pirates player to homer in the ASG since Dave Parker in 1981 and the seventh different player overall; also Roberto Clemente (1971), Wille Stargell (1965), Ralph Kiner (1949 and 1951), Vince DiMaggio (1943) and Arky Vaughan (twice in 1941)...Captured his fourth Silver Slugger Award - the most ever by a Pittsburgh player...Was a Gold Glove finalist; made just two errors in 301 total chances...Finished fifth in the BBWAA voting for N.L. Most Valuable Player...Tied career high in RBI...Set career high in walks and ranked fourth in the league in that department... His .328 average against LHP was the fourth-highest in the National League... Ranked third in the N.L. with a .361 average with runners in scoring position... Also ranked fourth in the league in OBP and seventh in OPS (.889)...His .312 batting average from May 6 thru the end of the season was the eighth highest in the N.L....Tied his club record for most RBI (16) in interleague play (also in 2012)...Made his sixth straight Opening Day start in center field; the longest streak since Andy Van Slyke made seven straight starts at that position for the Bucs from 1988-1994...Connected off Kevin Gregg for a home run on Opening day (4/6 at Cincinnati)...Left the game in the ninth inning on 4/10 at Milwaukee with left knee discomfort...Batted fourth in the starting lineup for the only time on 4/17 vs. Milwaukee and went 1-for-4 with a double and an RBI...Singled off Edwin Jackson for his 1000th career hit on 4/29 at Wrigley Field...Doubled in four straight games from 5/7-10... Shared N.L. Player-of-the-Week honors with Ryan Braun after batting .450 (9-for-20) with three homers and five RBI in five games during the week of 5/18-24...Hit .330 (35-for-106) with 17 RBI during the month of May...Had four hits and fell a home run shy of hitting for the cycle on 6/2 at San Francisco... Left the game on 6/27 vs. Atlanta after being hit by Julio Teheran on the left elbow...Hit .337 (31-for-92) in 25 games during the month of June and ranked fifth among N.L. players with a .422 on-base percentage...Had a career-high 19-game hitting streak from 6/21 thru 7/11 (22-for-62, .355)...Became the third player in the modern era (since 1900) to extend a single-season hitting streak to at least 15 games by hitting a walkoff home run when he did so with his fifth career walkoff blast on 7/11 vs. St. Louis (also Charlie "Piano Legs" Hickman on September 13, 1902 and Luis Gonzalez on May 11, 1999)... Scored his 600th career run on 7/23 vs. Washington...Was named N.l. Playerof-the-Week for the week of August 3-9 after hitting .563 (9-for-16) with two homers and eight RBI...Committed his first error (throwing) on 8/21 vs. San Francsico...Appeared in his 1000th career game on 8/24 at Miami...Made his second error (fielding) on 8/25 at Miami...Captured N.L. Player-of-theMonth honors for August after hitting .348 with five homers, 19 RBI and 18 runs scored; also posted the league's second-best OBP (.470) and third-best slugging percentage (.609)...Is the third player in team history to win the monthly award four separate times (also Barry Bonds and Bobby Bonilla)... Hit his 150th career home run on 9/10 vs. Milwaukee; is just the second player in team history to hit at least 150 home runs and steal 150 or more bases, joining Barry Bonds, who hit 176 home runs and recorded 251 stolen bases in his seven seasons with the Pirates... Tied career high with four walks on 9/20 at Los Angeles (also 9/1/09)...Received the MLB Roberto Clemente Award prior to Game Three of the World Series; is just the second Pittsburgh player to win the award since its inception in 1971 (also Willie Stargell in 1973)...Was also named the team MVP by the local chapter of the BBWAA - his fourth straight year of wining the award and fith time overall. 2015 POSTSEASON:Went 2-for-4 in the Wild Card Game vs. Chicago on 10/7. Finished third in the voting for National League MVP behind Clayton Kershaw and Giancarlo Stanton...Won his third straight Silver Slugger award...Led the National League in on-base percentage, the first Pittsburgh player to do so since Barry Bonds in 1992 (.456)...Also led the N.L. in OPS (.952) and ranked third in the batting race behind Colorado's Justin Morneau (.319) and teammate Josh Harrison (.315)...Tied career high in doubles...Ranked second in the league with 297 total bases, trailing only Miami's Giancarlo Stanton (299) and shared league lead with Stanton in extra-base hits (69)...Ranked among National League leaders in hits (T9th, 172), multi-hit games (T6th, 49), walks (4th, 84) and slugging percentage (2nd, .542)...Was selected to his fourth straight National League All-Star Team; the first Pittsburgh position player to be named four straight years since Bobby Bonilla from 1988-1991...Was also the first Pirates outfielder to be named to the All-Star team in four consecutive years since Roberto Clemente was named to four straight from 1969-1972...Led all National League outfielders with 4,519,440 votes and was the first Pirates player to start an All-Star Game since Jason Bay in 2006 when the city of Pittsburgh hosted the event...Singled off Seattle's Felix Hernandez in his first at bat; went 1-for-3 with a stolen base in the game while playing the first five innings in center field...Led all National League centerfielders in batting (.314), OBP (.410), home runs (25) and RBI (83)...Batted .328 in 70 home games and led all N.L. players with a .339 average in night games...Made all 146 defensive appearances (all starts) in center field; had one assist (at third base on 7/9 at St. Louis) and six errors (five fielding/one throwing)...Made his fifth straight Opening Day start in center field; the longest streak since Andy Van Slyke made seven straight starts at that position for the Bucs from 1988-1994...Reached base safely in 17 of his first 18 games; was leading the league in walks (21) thru 4/27...Left game on 4/11 at Milwaukee in eighth inning with discomfort in left ankle, but returned to action the following game...Hit safely in eight straight games from 4/12-19 (11-for-32, .344)...Connected off Yovani Gallardo for his first home run on 4/17 at PNC Park...Had three hits and reached base safely in all five plate appearances vs. Cincinnati on 4/21...Homered in three straight games from 4/21-23...Had four hits and fell a home run shy of hitting for the cycle on 5/5 vs. San Francisco...Missed game on 5/10 vs. St. Louis due to left foot discomfort...Ranked fifth among National League hitters with a .435 on-base percentage during the month of May...Had three hits and scored three runs on 6/1 at Los Angeles (NL); his home run off Zack Greinke on 6/1 was his first since 4/23...Homered in three straight games from 6/9-11 and seven times in his first 13 games in June...Had 15 extra-base hits in an 11-game stretch from 6/1-12, the most by a Pittsburgh player over 11 games since Ralph Kiner also had 15 in 1947...Had eight straight multi-hit games from 6/8-15...Was named N.L. Player-of-the-Week for the week of 6/9-15 after hitting .483 (14-for-29) and leading the Majors with four home runs, 13 RBI, a 1.034 slugging pct. and 30 total bases in seven games (all multi-hit games)...Hit safely in a season-high 12 straight games from 6/4-17 (21-for-49, .429)...Was named National League Player-of-the-Month for the month of June...Led all Major League players with 20 extra-base hits in June (12 doubles and eight home runs), the first Pittsburgh player with 20 extrabase hits in one month since Brian Giles (June 2001)...Batted .343 (36-for-105) in 26 games during the month of June with eight home runs and 25 RBI; over the last 40 years only two other Pittsburgh players had a month with at least a .340 batting average, eight homers and 25 RBI (Brian Giles in June 2001 and May 2000 and Barry Bonds in September 1992)...His 58 walks at the All-Star break fell five shy of the club-record of 63 set by Arky Vaughan in 1936 and matched by Ralph Kiner in 1950 and 1952...Went 4-for-5 and fell a home run shy of hitting for the cycle on 7/4 vs. Philadelphia...Homered twice in Pittsburgh's 6-5, 11-inning victory on 7/12 at Cincinnati; became the first Pittsburgh player to hit a game-tying home run in the ninth inning and a game-winning homer in extra innings...Was named co-Player-of-the-Week for the week of 7/7-13 (also Aroldis Chapman)...Was successful in each of first 15 stolen base attempts before being thrown out for the first time on 7/20 by Michael McKenry on a pitchout...Suffered an avulsion fracture involving the costochondral cartilage of the left eleventh rib while swinging in his final at bat on 8/3 at Arizona...Was placed on the 15-day D.L. on 8/11 (retro to 8/4) - the first time in his career that he spent time on the disabled list (the Pirates went 5-9 with him sidelined)...Was reinstated on 8/19 and went hitless in his first two games before hitting safely in four straight and eightof-10...Homered in back-to-back games on 8/24-25...Had three straight three-hit games from 9/6-8...Hit his first career inside-the-park home run on 9/10 at Philadelphia...Hit .347 (33-for-95) in 26 games during the month of September; reached base safely in each of his last 12 games and in 22 of his last 23...Batted .324 (44-for-136) with eight homers and 16 RBI in 37 games after being reinstated from the D.L. on 8/19 (Pirates went 24-13)...Finished the season with 128 career home runs and is currently tied with Richie Hebner for 12th place on the club's all-time home run list...Went 0-for-3 with a walk in the Wild Card Game vs. San Francisco on 10/1. 2013 SEASON: Was named National League MVP by the BBWAA; received 28-of-30 first-place votes and a total of 409 points (Arizona's Paul Goldschmidt finished second with 242 points)...Became the sixth different player in team history to win the award since it was created in 1931 (Paul Waner also received the National League Most Valuable Player Citation in 1927)...Was named to his third consecutive N.L. All-Star team - the first Pirates position player to be named to three in a row since Bobby Bonilla was selected to four straight from 1988-91...Captured his second straight Silver Slugger Award...Was named the National League's Most Outstanding Player by the MLBPA for the second straight year in a vote of all Major League players...Became the first Pirates player since Barry Bonds (1990-92) to hit at least 20 home runs and steal at least 20 bases in three consecutive seasons...Among league leaders, he ranked second in multi-hit games (60), third in hits and on-base percentage, fourth in walks, fifth in total bases (296), sixth in runs scored, stolen bases and slugging percentage and seventh in batting...His .336 (165-for-491) batting average from 4/30 thru the end of the season led all National League players who had at least 450 plate appearances in that time...Established career highs in doubles and OBP...Led N.L. center fielders in innings played (1378.0) and tied for seventh among all outfielders with a career-high 11 assists...Ranked second in the league with a .388 average against left-handed pitchers and second with a .330 average in night games...Ranked fifth with a .337 home batting average...Was Pittsburgh's Opening Day starter in center field for the fourth straight season...Swiped 100th career base on 4/3 and was leading the league with six stolen bases on 4/20...Snapped a career-worst 0-for-17 skid with a single in the seventh inning on 4/25 at Phialdelphia...Went 4-for-5 with a home run on 4/30 at Milwaukee...Went 4-for-4 on 5/7 vs. Seattle...Hit fourth career walkoff home run on 5/14 vs. Milwaukee...Was scratched from starting lineup on 5/19 vs. Houston due to right knee soreness...Went 10-for-21 (.474) with four multi-hit efforts over a five-game span from 5/22-26, raising average from .274 to .297....Scored his 400th career run on 6/9 at Chicago...Hit safely in 10 straight games from 6/28 to 7/8, going 16-for-38 (.421) with eight RBI...Stole home as part of a double-steal on 7/5 at Chicago (NL)...His batting average remained over .300 every day beginning on 7/6...Went 4-for-5 on 7/20 at Cincinnati...Homered twice on 7/22 at Washington (his eighth multi-homer game) and went deep five times in a six-game stretch from 7/13-22...Went 4-for-21 (.190) in his next six games thru 7/28...Was scratched from the starting lineup on 8/8 due to discomfort in his right shoulder, but singled as a pinch hitter in the seventh inning of the game..Reached base safely in 26 of his 28 games during the month of August, going 38-for-99 (.384) with 20 walks 16 multi-hit games and a league-leading .483 OBP; his batting average ranked second in N.L....Hit his 100th career home run on 9/3 at Milwaukee...Hit safely in a season-high 11 straight games from 9/1-13 (18-for-39, .462)...Reached base safely in each of his last 26 road games, dating back to 8/9...Was a unanimous choice by the BBWAA local chapter as the team's MVP. 2013 POSTSEASON: Hit safely in four of his six games, going 7-for-21 (.333) with five walks, a double and three runs scored...Reached base safely four times in five plate appearances in the Wild Card Game vs. Cincinnati on 10/1...Went 5-for-10 in the first three N.L.D.S. games against St. Louis before going hitless in the final two games (eight at bats). Finished third in the Baseball Writer's voting for National League MVP with 245 points, trailing only Buster Posey (422) and Ryan Braun (285)...Was named National League's Most Outstanding Player by the MLBPA in a vote of all Major League Players...Was named to the Louisville Slugger Silver Slugger team and captured his first Rawlings Gold Glove Award...Joins Barry Bonds (1990-92), Andy Van Slyke (1992) and Jay Bell (1993) as the only Pirates to win Silver Slugger and Gold Glove awards in the same season...Led National League in hits - the first Pittsburgh player to do so since Andy Van Slyke in 1992 (199)...Ranked second in on-base percentage, slugging percentage and total bases (328)...Became the fourth Pittsburgh player to hit at least 30 home runs and steal at least 20 bases in the same season (also Dave Parker in 1978, Barry Bonds in 1990-92 and Jason Bay in 2005)...Was one of three players in the Major Leagues with a 30-20 season (also Ryan Braun and Mike Trout)...Set club record for most home runs hit by a center fielder in a season (previous high was 28 by Brian Giles in 1999)...His .327 batting average ranked second in the N.L. behind Buster Posey (.336) and was the highest by a Pittsburgh player since Freddy Sanchez led the league with a .344 mark in 2006...Tied for second in the league in runs scored, tied for eighth in home runs and ranked fifth with 53 multi-hit games...Led the league with a .347 batting average in night games and ranked second in the N.L. with a .326 road batting average...His .392 average against left-handed pitchers ranked second in the league behind Posey's .433 mark...Led all National League center fielders in fielding percentage (.997), making just one error (a fielding miscue on 4/29 at Atlanta) in 371 total chances...Finished season with a 135-game errorless streak...Set club record for most RBI at home (56), breaking previous mark of 55 by Aramis Ramirez in 2001...Tied for fifth in the league with 13 intentional walks...Was selected to his second straight All-Star game and played the final five innings in center field while going 1-for-2 at the plate; singled off Chicago's Chris Sale in the sixth inning and grounded out to third base against Tampa Bay's Fernando Rodney in the ninth...Also participated in the Home Run Derby on 7/9 and hit four home runs in the first round (did not advance)...Was Pittsburgh's Opening Day starter in center field for the third straight season...Started each of the first 23 games before sitting out 5/2...Left the game on 5/3 at St. Louis in the fourth inning with the stomach flu...Hit his first home run of the season in his 26th game on 5/8 vs. Washington...Homered three times and had a pair of 4-for-4 games during the week of 5/7-13...Homered twice on 5/17 at Washington and again two days later in Detroit...Hit .360 with eight home runs and 18 RBI in 25 games during the month of May while ranking fourth in slugging percentage (.709)...Was named N.L. Player-of-the-Month in June after batting .370 with seven homers and 26 RBI in 27 games; ranked second in RBI, third in batting, tied for third in home runs and ranked seventh in both slugging percentage (.676) and on-base percentage (.420)...Left the game on 6/30 at St. Louis with a slightly sprained wrist as a result of making a diving catch and missed the game on 7/1...Returned to action on 7/2 and went 4-for-5 with three runs scored vs. Houston...Had six consecutive hits on 7/2-3...His 14-for-21 stretch with 11 runs, two homers and six RBI over a five-game span from 6/29 to 7/4, made him the first Bucco since Honus Wagner in 1904 to have 14 hits and 11 runs in a five-game span (Wagner had 15 hits and 11 runs over five games in June of that year)...Was named Player-of-the-Week from 7/2-8...His .362 average at the All-Star break led all Major League hitters - the first Pittsburgh player to lead the Majors in hitting at the break since Matty Alou in 1968...Homered twice on 7/8 vs. San Francisco and homered in four straight games from 7/8-15...Won Player-of-the-Week honors during the shortened week following the All-Star break, giving him back-to-back POTW awards; the first Pittsburgh player to do so since Jason Bay in May of 2006...Hit .446 with seven home runs, 15 RBI and a .510 slugging percentage in 25 games during the month of July and was named N.L. Player-of-the-Month - the first Bucco to win consecutive monthly honors since Bobby Bonilla in April and May of 1988 (his .446 average is the highest by a Pirates player in July during the modern era - since 1900)...His .373 batting average after 100 games was the highest batting average for a Pirates player thru his first 100 games of a season since Paul Waner in 1937...Was leading the league with a .373 batting average when he was hit by a pitch thrown by Aroldis Chapman on 8/3 at Cincinnati; batted .248 (54-for-218) with nine home runs and 30 RBI in his last 57 games...Homered six times in a six-game span from 7/8-18, but hit just two home runs in his next 47 games thru 9/8...Had his Major League leading sixth and final four-hit game on 9/4 vs. Houston...Homered in back-to-back games on 9/9-10 and hit six home runs in an 11-game span from 9/9-20...Hit third career walkoff home run on 9/29 vs. Cincinnati...Was a unanimous choice by the BBWAA local chapter as the team's MVP...Was also named the Dapper Dan Man-of-the-Year in Pittsburgh; an award presented since 1939 to the top local sports figure. Established career highs in games, at bats, home runs and RBI duringsecond full season in the Major Leagues...Led Pirates in homers, RBI and stolen bases...Became the eighth player in team history to have at least 20 home runs and 20 stolen bases inthe same season...His 89 RBI ranked second behind Matt Kemp (123) among National Leaguecenter fielders...Ranked fifth in the N.L. in walks and second behind Joey Votto (2880) with2826 pitches faced...Hit .291 with 14 home runs prior to the break and was named to his firstNational League All-Star team...Led N.L. center fielders with 430 chances and 414 putouts;ranked second with nine assists and third with seven errors (five fielding/two throwing)...WasPittsburgh's Opening Day starter in CF for the second straight season and went 2-for-4 with atwo-run homer off Ryan Dempster at Wrigley Field...Missed third game of the season due to astiff neck - suffered the day before while diving for a ball in center field...Hit safely in five of hisfirst six games (7-for-18, .389) before going 3-for-31 in his next eight games thru 4/16...Led offgame on 4/17 at Cincinnati with a home run (seventh career) and also knocked in winning run in the 8th inning while going 3-for-3 in thegame...Snapped an 0-for-16 streak with a home run on 4/29 at Colorado...Connected off Jason Hammel for eighth career leadoff home runon 4/30 at Colorado...Had three hits and homered twice (third career multi-homer game) on 5/10 vs. Los Angeles...Batted in the cleanupspot for the first time in his career on 6/7 vs. Arizona and went 1-for-2 with two walks and three runs scored...Hit second career walkoffhome run on 6/8 vs. Arizona - a solo shot leading off the 12th inning...Began month of June with a nine-game hitting streak (17-for-35,.486), raising average from .247 to .283; streak actually reached 15 games before his hit on 6/11 vs. New York was reviewed and changedto an error on the third baseman...Batted .347 (33-for-95) with 14 RBI and 18 runs scored in 27 games during the month of June; rankedeighth in the league in batting and tied for seventh in hits during the month...Played final three innings in center field and went 0-for-1 atthe plate at the MLB All-Star game, played in Arizona on 7/12...Homered in back-to-back games on 8/29-30 and led Pirates with 18 RBI inAugust...Homered twice (fourth career multi-homer game) on 9/7 vs. Houston...Hit final home run on 9/13 vs. St. Louis. Led Pirates in hits, doubles, triples, runs, walks and stolen bases during first full season in the MajorLeagues...Led all National League center fielders with a .363 on-base percentage...Ranked second among N.L. center fielders in hitsbehind Chicago's Marlon Byrd (168) and second in runs (93) as a CF behind Arizona's Chris Young (94)...Hit .302 (57-for-189) in 53games from the third spot of the starting lineup, .279 (19-for-68) in 17 games from the second spot and .278 (87-for-313) in 82 gamesfrom the leadoff spot...Made 152 starts in center field and rankedthird with 386 total chances...Had eight assists and committed fiveerrors (three fielding/two throwing)...His 33 stolen bases were themost by a Pittsburgh player since Tony Womack swiped 58 in1998...Was Pittsburgh's Opening Day starter in center field and went1-for-4 with a double and two runs scored...Tallied three hits in hissecond game on 4/7 vs. Los Angeles...Connected off Edwin Jacksonfor first home run of the season on 4/11 at Arizona...Was successfulin each of his first six stolen base attempts before being caught forthe first time on 4/17 vs. Cincinnati...Reached base safely in 11straight games from 4/10-22...Hit safely in five straight games from4/24-28, going 11-for-26 (.423) and raising average from .254 to.303...Had four hits and homered twice on 4/28 at Milwaukee...Leftgame on 5/2 at Los Angeles after suffering a mildly sprained rightankle in a play at first base in the 3rd inning...Sat out the game on5/4...Produced four straight multi-hit games after returning to action on 5/5, going 9-for-13 and raising average from .288 to .333on 5/8...Had career-high five hits and scored career-high five runs on 5/14 at Chicago (NL) - the first Bucco with at least five hitsand five runs in the same game since Rennie Stennett went 7-for-7 with five runs at Chicago on 9/16/75...Reached base safely in24 of his 28 games in May while batting .327...Had four hits on 6/5 vs. San Francisco to raise season average to .320; hit .266 (97-for-364) from that point on...Tied career high (second time) with three stolen bases on 6/15 vs. Chicago (AL)...Went 6-for-35 (.171)in his 10 games leading up to the All-Star break...Hit safely in six straight games after the break and in eight of his first nine...Leftgame on 7/18 with neck soreness after making catch in 8th inning and missed the next six games...Connected off Cincinnati's JohnnyCueto for fifth career leadoff home run on 8/4 at PNC Park...Homered in back-to-back games on 8/18-19 and went deep three timesin a four-game span from 8/16-19...Reached base safely in 24 straight games from 9/4-29 and in 27 of his final 28...Led off the bottomof the 1st inning with a home run off Arizona's Daniel Hudson on 9/19 for his sixth career leadoff home run...His throwing error on9/24 snapped a 68-game errorless streak; his second-longest streak behind a 74-gamer in 2009 from 7/11 thru 10/4. Was named Major League Rookie-of-the-Year byBaseball America...Finished fourth in the voting for the MLB Jackie RobinsonRookie-of-the-Year award...Also named to Topp's Major League All-Rookie team...LedPirates in runs scored and stolen bases despite not playing first Major Leaguegame until 6/4...Led all National League rookies with 47 extra-base hits...Alsoranked second among N.L. rookies in multi-hit games (36), runs, walks and totalbases (204)...Ranked third in RBI, third in stolen bases, third in sluggingpercentage (.471), third in doubles, fifth in batting and fourth in on-basepercentage among N.L. rookies...Also tied for fourth in home runs...Led all N.L.rookies with 10 outfield assists, the most by a rookie outfielder since Atlanta's JeffFrancoeur had 13 in 2005...Had three separate hitting streaks of 10 or moregames; a 13-game streak from 6/11-25, a 12-game streak from 8/17-30 and a10-game streak from 9/13-23 - the first Bucco rookie to have three hitting streaksof 10 or more games since Richie Zisk in 1973 (10, 10 and 12 games)...Led offall 108 games he played and ranked third among N.L. leadoff hitters in RBI andfifth in slugging percentage...Ranked third among N.L. leadoff hitters in home runs behind Jimmy Rollins (18) and Alfonso Soriano (14)...Hit .600 (6-for-10) with the bases loaded to rank third among N.L. players behind Todd Helton (.625) and Kaz Matsui (.625)...Hit four home runs leading off the 1stinning - the first Pittsburgh rookie to do so and the first Bucco overall with four since Al Martin hit six in 1999...Began season with Triple-A Indianapoliswhere he made 47 starts in center field and one in left field (4/25 at Columbus)...Hit .304 in 29 games in May, which included a four-hit game on 5/14at Rochester...Hit safely in last seven games with Indy, going 13-for-31 (.419) with two homers, four RBI and six runs scored...Hit .361 against left-handedpitchers and .279 against right-handed pitchers while playing with Indy...Was selected by Pittsburgh on 6/4 after Nate McLouth was traded to Atlanta...MadeMajor League debut on 6/4 vs. New York and singled off Mike Pelfrey in first at bat; was the leadoff batter and went 2-for-4 with a walk, three runsscored, an RBI and a stolen base in first game while playing center field...Had four hits, including two triples, in 15-inning game at Atlanta on 6/9 - thefirst Pittsburgh player with two triples in a game since Tike Redman on 8/1/03...Connected off Francisco Liriano for first Major League home run on 6/17at Minnesota...Tripled in three straight games from 6/19-21 - the first Pittsburgh rookie to do so since Bob Elliott in June 1940...Also tallied five triples inhis first 17 big league games; only one player who debuted in Baseball's Integrated Era (1947 to date) had reached five triples in as few games - JeffStone, who did it in his first 16 games for the Phillies over the 1983-84 seasons...Hit safely in career-high 13 straight games from 6/11-25, going 19-for-57 (.333) with 13 RBI...Capped hitting streak with walkoff single vs. Cleveland on 6/25...Went 1-for-18in his next five games, dropping average from .330 to .284...Committed first error (throwing) on 6/28 vs.Kansas City...Led all Major League players with five triples during the month of June...Also led Pirates with18 RBI in June...Went 4-for-5 and homered three times on 8/1 vs. Washington - the 10th different Pittsburghplayer to hit three home runs in one game and the first since Aramis Ramirez on 4/8/01 at Houston (thefirst in Pittsburgh since Darnell Coles on 9/30/87 at Three Rivers Stadium)...Also became the first rookiein club history to hit three homers in a game and the second leadoff batter (also Roman Mejias on 5/4/58at Seals Stadium in SF)...Connected off Craig Stammen for first leadoff homer on 8/1...Was successful ineach of his first nine stolen base attempts before being caught for the first time on 8/2 (Wil Nieves)...Hitsecond leadoff homer in three games when he went deep off Washington's Garrett Mock on 8/3...Started54 consecutive games in center field before missing first game on 8/5...Walked three times and swipedthree bases on 8/11 at Colorado...Hit safely in 12 straight games from 8/17-30, going 16-for-48 (.333)with three homers, nine RBI and nine runs scored...Hit first career walkoff homer in 6-4 victory vs.Philadelphia on 8/25 (off Brad Lidge)...Had four RBI and fell a triple shy of hitting for the cycle on 8/28at Milwaukee...Led Pirates in homers (eight) and RBI (19) in August...Walked four times on 9/1 at Cincinnati...Reached base safely in nine straight gamesfrom 8/31 thru 9/9 and in 21-of-22 from 8/17 thru 9/9...Went hitless in 11 straight at bats from 9/9-11 and 5-for-34 (.147) in an eight-game stretchfrom 9/7-15...Connected off Cincinnati's Johnny Cueto for fourth leadoff home run on 9/22...Picked up team-leading 10th outfield assist on 9/23 vs. Cincinnati...Reached base safely in 20 of his last 21 games, hitting safely in 18 (29-for-82, .354)...Started 108 of the last 109 games in center field...Led club with20 infield singles (one bunt base hit)...Was named the 2009 Roberto Clemente Award winner by the Pittsburgh chapter of the Baseball Writers Associationof America; an award presented annually since 1973 to the team MVP. Spent entire season with Indianapolis...Took home International League mid-season All-Star honors and was also named the Triple-A All-StarGame MVP...Ranked third in the International League in walks and games played, seventh in stolen bases, tied for ninth in hits and 10th in on-base percentage(.372)...Made 120 starts in center field, nine in left field and one as the designated hitter...Hit eight of his nine home runs before the All-Star break andseven of his nine homers came from the leadoff spot in the batting order...Was batting .194 (6-for-31) following the action on 4/10 before hitting safelyin his next 13 games to raise average to .294 on 4/25...Went 3-for-4 with two doubles, a home run and three RBI on 4/25 vs. Louisville...Reached basesafely in 27 straight games from 4/7-5/5; hit 309 (34-for-110) with 20 runs scored and 14 RBI during the streak...Hit .304 (34-for-112) with six doubles,two home runs and 16 runs scored while being named Indianapolis' Player-of-the-Month for May...Also swiped 12 bases in the month of May, which rankedsecond among all Triple-A players...Committed just one error in his first 88 games before being charged with a miscue in back-to-back games on 7/8-9...Represented the Pirates at the Major League Baseball Futures Game in New York on 7/13 (went hitless in two at bats)...Was named the InternationalLeague's Top Star at the Triple-A All-Star Game after going 2-for-2 with two RBI...Hit .318 (35-for-110) from 8/1 thru remainder of the season. Hit .265 (136-for-513) with 24 doubles, three triples, 11 home runs, 53 RBI and 21 stolen bases in 121 combined games between Double-A Altoona and Indianapolis...Began season with Altoona...Went hitless in first 15 at bats before going 3-for-4 with three runs scored on 4/13 vs. Reading...Hit.189 (14-for-74) in April and .230 (26-for-113) in May...Collected three extra base hits while also scoring four runs on 4/13 vs. Reading...Hit first twohome runs on consecutive days on 5/5 and 5/6 vs. Akron...Legged out first of two inside-the-park home runs on 5/21 at Akron (the first by a Curveplayer since Garrett Long on 7/28/00)...Went 5-for-7 in 6/2 doubleheader vs. Reading...Recorded second inside-the-park home run on 8/5 vs. NewHampshire...Reached base safely in final 20 games with the Curve before being promoted to Indianapolis on 8/17...Hit safely in 15 of his 17 games withthe Indians, posting hits in each of first seven contests and eight straight games to end the season...Smacked first Triple-A home run on 8/19 at Charlotte...Hit.286 (28-for-98) with five doubles, two triples, four RBI, eight stolen bases and 13 runs scored in 29 games for Phoenix Desert Dogs in Arizona FallLeague...Was named to the Arizona Fall League Rising Stars team and Arizona Fall League All-Prospect Team. Was named Pittsburgh's Minor League Player-of-the-Year...Also took home South Atlantic League mid and post-season All-Star honors...Was the starting center fielder for the Northern Division in the SAL All-Star Game...Hit .294 (156-for-531) with 17home runs, 74 RBI and 23 stolen bases in 134 combined games between Hickory (A) and Altoona...Established minor league careerhighs in home runs and RBI...Put together hitting streaks of 11 games (5/20-30) and 12 games (7/30-8/13) while playing withHickory...Reached base safely in 28 straight games from 7/13 thru 8/13...Posted a .352 average (43-for-122) in his final 31 gameswith the Crawdads...Was promoted to Altoona on 8/15 and became the youngest player in Curve history (19 years, 10 months)...Hit.375 (15-for-40) in his first 10 Double-A games and reached base safely in each of his first 15 contests...Finished season bycombining to hit .335 (67-for-200) in his final 51 games between Hickory (31 games) and Altoona (20 games)...Hit .182 (4-for-22)in five Eastern League playoff games. Hit .310 (65-for-210) with 12 doubles, four triples, two home runs, 35 RBI and 17 stolen bases in 58 combined gamesbetween the GCL Pirates and Williamsport (A)...Began professional career in Bradenton after being selected by Pittsburgh in the firstround of the June draft (11th overall selection)...Ranked second in the Gulf Coast League in runs, walks and on-base percentage(.411)...Went 1-for-3 with an RBI in professional debut on 6/27 vs. the GCL Reds...Went 5-for-5 with two doubles, a triple, three RBIand two runs scored on 7/8 against the GCL Red Sox...Batted .307 (23-for-75) in 21 games during the month of July...Hit firstprofessional home run on 8/12 vs. the GCL Red Sox...Hit second of two home runs with GCL Pirates on 8/22 against the GCL Twins...Hit.420 (21-for-50) against lefthanders while playing with GCL Bucs...Was promoted to Williamsport following the conclusion of the GCLseason...Hit safely in each of his first seven games with the Crosscutters, going 13-for-29 (.448)...Went 1-for-5 in Williamsportdebut on 8/26 at Aberdeen...Went 4-for-6 with a triple, two RBI and two runs scored on 8/27 at Aberdeen...Went 2-for-8 with an RBIin two post-season games with Williamsport...Was successful in 17 of his 19 stolen base attempts between Bradenton andWilliamsport. December 12, 2018 Philadelphia Phillies signed free agent RF Andrew McCutchen. October 29, 2018 RF Andrew McCutchen elected free agency. August 19, 2014 Pittsburgh Pirates activated CF Andrew McCutchen from the 15-day disabled list. August 11, 2014 Pittsburgh Pirates placed CF Andrew McCutchen on the 15-day disabled list retroactive to August 4, 2014. Avulsion fracture involving the costochondral cartilage of the left 11th rib. June 3, 2009 Pittsburgh Pirates selected the contract of CF Andrew McCutchen from Indianapolis Indians.